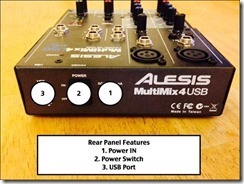 The Alesis MulltiMix 4 USB Mixer is a compact four channel mixer that features a digital output. 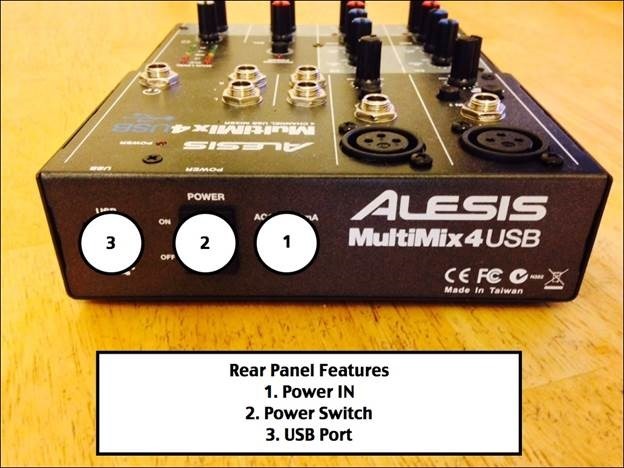 The top panel houses the four input channels on the Alesis MultiMix 4 USB Mixer, and all inputs accept a 1/4” size input. To view your main output levels the mixer contains a five-level, multi-colored LED meter. Additionally, Channels One and Two feature a XLR Microphone input, a HPF (High-Pass Filter) switch, gain trims, both high and low EQ, and pan controls. Line-In One also allows for a Guitar Input, with guitar switch. Channels Three and Four share a level and balance control. Out of the box you will receive; MultiMix 4 USB, USB Cable, Power Adapter, Quick-Start Guide, and Safety Instructions/Warrant Information Booklet. The MultiMix 4 USB is a class compliant device that can be used with any digital audio workstation or recording software that supports USB audio. 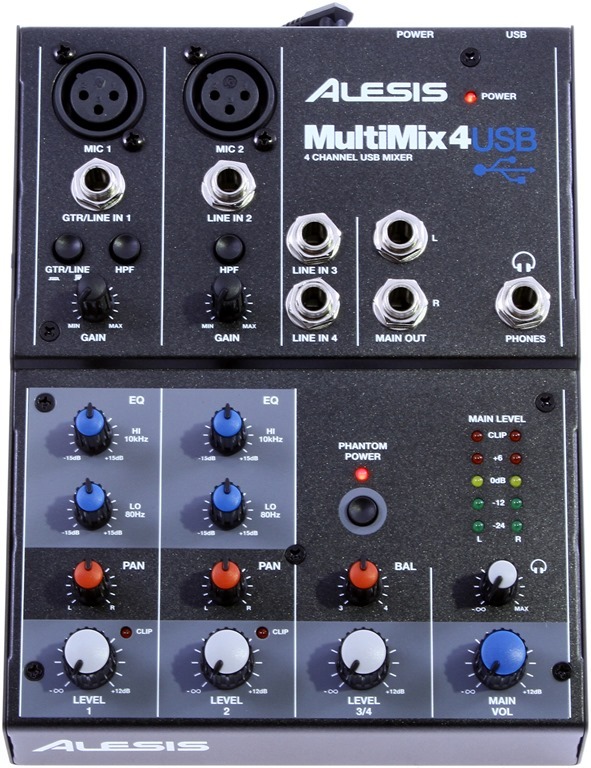 I first received the Alesis MultiMix 4 Channel USB Mixer in hopes to alleviate some of the headache that goes into preparing/producing my personal podcast episodes. My main problems were stemming from the production time as well as the sound quality of my show. 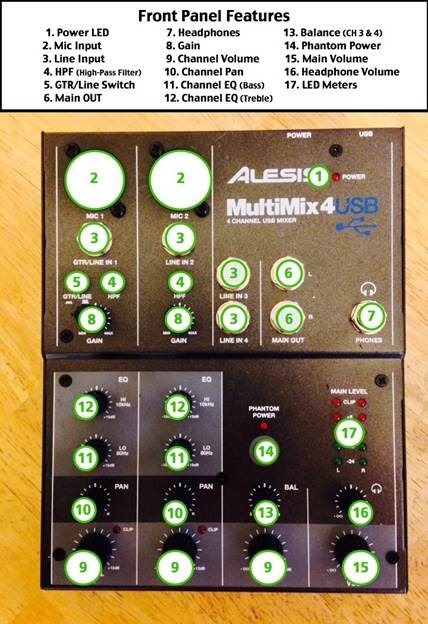 I was informed that an audio mixer, such as the Alesis MultiMix 4, could solve some of those issues. The sound quality of my podcast is extremely important to me, and prior to receiving the Alesis Multimix 4, my episodes were of such low quality, I simply was embarrassed to share them with anyone. I had done everything I could to eliminate unwanted background noise, as well as keep all of my input sources at the same level, however adjusting the settings on my iMac and ATR-2100 Microphone were not enough. I can recall an episode which included a great interview that had to be discarded due to the massive gain of my microphone. Even at the lowest input setting, the microphone was able to not only pick up the voice of my fiancé, but the voice of her mother as well with whom she was Skyping! This proved to be extremely frustrating, and limited my motivation to continue podcasting. Another problem that I was facing while producing podcast episodes was dedicating too much of my time to making an episode. I was lacking all the tools to be able to do live episodes, which wouldn’t require me to do so much editing. Fortunately the Alesis MultiMix 4 was able to solve quite a few of my problems. The main function that made an immediate difference was the Gain control knob. As soon as the microphone was plugged into the mixer, I had the ability to control how much my microphone picked up, and that is invaluable to me in terms of sound quality. It allowed me to be confident that my listeners would only hear what I wanted them to. Another great aspect of the sound quality controls was that I was able to adjust how I sounded to my listeners as well. For Instance, when I wanted to lower my voice in order to come off more relaxed and calm sounding to my listeners, I now had the capability to do so with the EQ controls. One of the best features of the Alesis MultiMix 4 was it’s ability to incorporate all the sounds that I needed to produce a show, into one sound file. I was able to do all of my episodes live with a co-host using Google Hangouts and play my intro music, sound bites, pre-recorded interviews, and anything else that my podcast required, and simply input the entire recording into one Mp3 file. This cut my time spent preparing my episodes in half, and was a huge stress reliever. 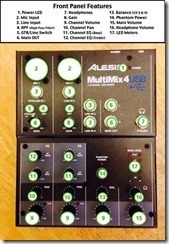 Overall I was more than impressed with the functionality of the Alesis MultiMix 4, and additionally it seems well-built and strong. One minor issue that I ran into while recording with Google Hangouts was a small buzzing when using the headphone input on the mixer. This occurred with multiple sets of headphones which leads me to suspect something faulty in this specific mixer. Aside from this small issue, the Alesis MultiMix 4 has been a great addition to the podcast/audio equipment and is highly recommended. Nice review. I have never used a mixer, but getting ready to get one. Does this mixer allow me to record in 4 separate tracks to the PC, or do they get mixed into just a single PC input?